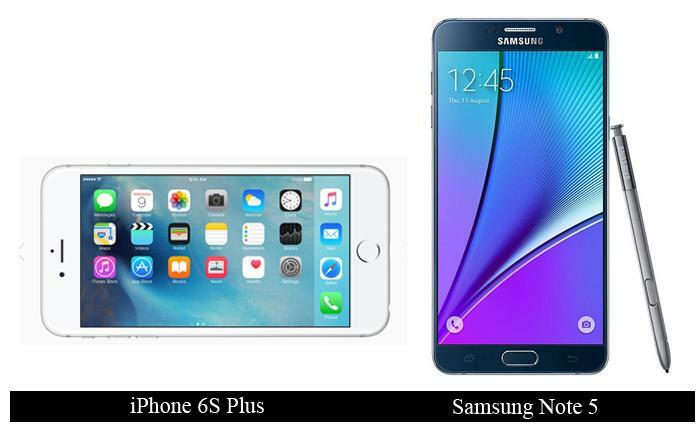 IPhone 6s Plus Vs. Samsung Galaxy Note 5: Which one should you buy? There is always stiff competition between two major smartphone manufacturers in the world, Apple, and Samsung. There is always a debate as to which one is more superior. Every time there are flagship releases from both the manufacturers there is a big competition which we can witness. Here I would tell you which one you should buy. Hope this article is useful. Both these guys the Apple iPhone 6s Plus and Samsung galaxy Note 5 are without a doubt the best smartphone in the world right now and for people looking for owning a premium flagship smartphone, both these phones will always be on the top list. Now always remains the question which is the smartphone you need to buy, the iPhone or the Note 5. I would like to answer this million dollar question and get you in the way from where you can clearly decide without any dilemma which is the smartphone which best suites you. If you look onto both the devices both of them have some real innovative features because of which it is difficult to choose among them. One of the major hurdles which come into the way is the platform or the OS. Both OS are extremely powerful and user friendly because of which choosing becomes even more difficult. The OS can be sometimes the defining feature by which you decide as well. The companies have tried their level best to really make their smartphone better than the other, and here it is evident that making a clear decision is not a cakewalk. Now let me tell you that both these smartphone are wonderfully crafted, studded with superb features and also are performing powerhouses. Just take a look at the specs and you will get an idea of the quality both these smartphone possess. These two is the definition of smartphone of the 21st Century. If you want to know how much the smartphone industry has grown, take a look at these two biggies. Bringing a smartphone with high specs to the market may be easy, but justifying the spec sheet by replicating it into performance is not quite easy as it sounds. Our smartphone ecosystem is highly competitive, so to gain attention different manufacturers are stepping up their game and bringing really nerve-wrecking and mouth-watering specs to the market, but we all know when it comes to the actual performance nearly 90% of them fail. But there are some who really replicate their spec sheet into performance and both the companies in picture right now have done a great job. I will take you along the journey of understanding both these smartphone in depth and you yourself will be able to make a very clear and conscious decision. Now personally speaking, at first I was too in a fix as to which one is the best and which one I should go for. After thorough research on the topic I have come to a conclusion, which I would love to explain it here. I will go through almost each and every aspect of the smartphone and without bias give you a clear picture. Personally speaking I love both these smartphone, but if only one is the choice; read along. I will write about both the smartphones here simultaneously. This is one of the most beautifully crafted iPhones ever created by Apple. It is large, beautiful, and sturdy and also has a very good build quality. Apple always believed in bringing smaller devices which could be easier to handle with one hand and may be the iOS never needed a large screen or Apple never thought about it but here by bringing the iPhone 6 series they have broken all the rules the company has been abiding by. The design is a beautifully crafted one. It has as large 5.5" screen. Now because of the screen the phone is fairly large and using it by one hand will certainly need a lot of hand gymnastics, one thing that really does not go well with the design is the basil size, Apple believes in symmetrical design and so has maintained large basil around the display making this phone a larger footprint. All the buttons have good feedback and are crafted brilliantly. Overall speaking the smartphone is a charming and beautiful one and arguably one of the best in the world today. The back is brushed aluminum which looks beautiful but is slippery. This is perhaps the best design you would find on any smartphone in the world. This is just a magnified version of the Samsung S6 and S7. Almost the entire designing cue is relatively taken from the S6 and the S7 which is quite visibly apparent. Now the reason which I say this is the best designed smartphone is because of the screen to body ratio. The ratios play an important role in actually bringing out a good design. The super thin basil on the sides adds beauty to the overall construction of the device. The back is a full tampered glass panel which looks stunning, but it too has its own negatives although it is quite negligible. The back is slippery and also a finger print magnet. Now why I like the Note's design is although the Note 5 has a larger 5.7" screen the phone is smaller than the Apple iPhone 6s Plus which has a 5.5" screen. This is more of a fantastic design. Now if I were to choose between both the designs, the Note 5 is a little bit more beautiful and less slippery too. But the iPhone looks a bit slightly premium from my view; rest is your personal choice. The iPhone 6s has a 5.5" LED – backlit IPS full HD LCD display generating a Pixel density of 401PPI. This is a very brilliant display which Apple claims to be the best the company has ever built. As this is standard LCD panel the colours are accurate, and the colour temperature too is good. The realistic colours are the characteristic of the display. The white looks as white and not like the bluish tinge you find on other LCD panels. Being a LED-backlit display it brightens up to good level. The Full HD display is quite sharp and detailed. Now the Note 5 has a 5.7" Quad HD (1440X2560) Amoled display generating a whopping pixel density of 518 PPI. Now on paper this display is far more superior to the iPhone's but in reality the Amoled panel too has some issues. The Amoled has punchy colours and because of the higher PPI it looks quite sharp and detailed too. Now as both these displays are made up of different technologies there is quite bit of difference in the overall functioning of the display. The Amoled display on the Note 5 has punchier colours than the iPhone but may not look as realistic as the Apple's display but clearly is sharper and beautiful. The black looks deeper. The only problem I witnessed is that the whites on the Amoled look a little bit pinkish. Overall speaking the Note 5 has a little more beautiful display. iOS is simple, intuitive and above all more fluid than Android. iPhone 6s Plus runs on iOS 9 which is upgradable to iOS 9.3.2. This time around the iPhone 6s has fantastic feature which Apple calls 3D Touch. It works on two basic principles, the first is "peek" and the second one is "pop". Now what this does is the screen recognises the pressure you put onto the screen and vary the different functions it does accordingly. The "peek" feature allows you to take a quick look at any file, like a preview by pressing a little harder on the screen and reverse back to the original page you were on, by releasing your finger. The "pop" feature allows you to instantly pop into the file by pressing harder on the screen, which is a very good and useful feature. Rest everything is what we love and what we a have always used. Now one thing which is quite true is that, it is not necessary that all the third party apps should have 3D Touch, now developers are coming up with good apps where this feature can be applied and when as the numbers increase it will be a great sign. The oOS runs perfectly smooth. Now what you will not get on an iOS is pretty simple, the personalisation and also the wide range of features which you get on an Android. The notification panel here in iOS is pretty tame. Other than that iOS is fantastic and works really fluid. Samsung Touch-Wiz runs on the Android 5.1.1 Lollipop which is upgradable to 6.0.1 Marshmallow. Now Samsung's custom user Interface runs brilliantly on the device, and has a lot of intuitive and usable features. The Note 5 is equipped with the S-pen Stylus which is almost like a mouse for a computer. It has many superb features like, taking down a quick note while the screen is off, crop areas of screen shots for easy sharing and the most intuitive of them all, taking multiple screenshots and joining them together to make it a full long document. Now when you compare the Samsung's custom UI to the Apple's iOS the Samsung looks a bit cartoony whereas the later looks a bit premium. Both are easier to use but Samsung has more features. Now the 3D Touch is a feature which people will use more often and will form a regular part of their activity on the smartphone whereas the Note 5's Stylus is down to personal preference. The Apple's UI is a bit more fluid. As the article will be too long if I give individual points to all these above headings, I would like to sum it up in one point itself. The Apple iPhone 6S Plus runs on Dual-Core 1.8 GHz Twister CPU, on the Apple A9 chipset and PowerVR GT7600 (six-core graphics) GPU powered by 2GB of RAM. This may look a little tame on paper but in reality is blazing fast. This is where Apple does its best. Apple knows how much power is needed to run the iOS smoothly and provides the same hardware specs, which helps in generating absolutely performing devices. There is no lag or stutter. No matter what you through at it, it runs it smoothly and fluidly. The finger print scanner on the home button is blazingly fast, so fast that you can miss out on your notifications. The probability of the sensor reading your fingerprint is 100% no doubt about it. The storage is where I think Apple should rethink. The base model should be the 32 GB version instead of the 16 GB. The battery is a 2750mAH one. Even the battery is quite smaller when considering the bigger screen and features, it will give you around a full day of moderate usage, comparing to the Note 5 even though the iPhone 6s Plus has a smaller battery it gives better performance. The Samsung Galaxy note 5 runs on Exynos 7420 Octa chipset with CPUs Cortex-A53 and Cortex-A57 clocking at 1.5 GHz and 2.1 GHz respectively, coupled with Mali-T760MP8 GPU and a whopping 4 GB of RAM. Now spec wise this proposition looks insanely powerful and is powerful in reality as well. The phone runs superbly without any lag and is extremely smooth while handling big advanced games as well. But when you compare it with the iPhone it lags a bit behind. The minor stutter of the Touch-wiz is there but is quite negligible; one thing I noticed that while switching between apps the reloading of previous apps takes a little bit of time. The fingerprint scanner too works well but sometimes, on rare occasions it may give you a miss. The Note 5 has a base storage of 32 GB which is good and if you are a power user you can go for the 64 or 128 GB variants by paying a little bit extra. The battery is 3000mAH and although it is smaller than the previous Note 4, it will help you in giving you a full day of normal usage. Now performance wise I would rate iPhone 6s Plus as the better handset and battery backup is literally a tie with Samsung's ultra-power saving mode and fast charging. The iPhone 6s Plus has a 12 MP shooter whereas the Note 5 has a 16 MP one. Both these devices take gorgeous photos. Both the cameras have optical image stabilization, 4K video as well as Slow motion capture. Now launching the camera app is quite simple on the Note 5 by just double tapping the home button which will launch the camera in seconds, whereas the iPhone too has a shortcut from the Lock Screen but if you happen to use the fingerprint scanner, you will give it a miss. Both these cameras give excellent details and good colours, now what you actually get here is, realistic colours and less sharpening on the iPhone 6s Plus and more saturated colours and more sharpening found on the Note 5. The selfie camera too is fantastic on the Note 5. So camera is always better on the Note 5. But still I feel it is down on personal preference, if you like realistic colours go for iPhone and if you need good punchy colours go for Note, personally speaking I like the camera on the Note 5. The 64 GB variant of the Note 5 is available at around Rs. 46000 whereas the 64 GB variant of the Apple iPhone 6s Plus is priced at approximately Rs. 70,000. So you can guess that the iPhone is a hell lot expensive. This is truly ridiculous on the part of Apple. The company needs to bring down the price so that people can get the better phones at good justified pricing rather than be too expensive. Pros: Superb design, easy UI, fantastic display, excellent build quality, lag free performance, 3D Touch pretty useful feature, superb camera. Cons:Slippery back, a bit overpriced, base variant should be the 32 or 64 GB one. Pros: fantastic and lovely design, excellent display, S pen Stylus a very useful tool, great camera, good value for money, superb performance. Cons: slippery and fingerprint prone back. It is really tough to make a choice here, both the phones are superb and both of the differences you would find comes down to personal preference. Both phones are extremely close on competition, whichever choice you make you will end up making a very good choice. If you ask me to choose, I would choose the Note 5 for being a very good value for money, but if you take consistency in the performance into consideration Apple scores big. The overall package is really the Note 5.